At ELO Engineering, Inc., we’ve invested millions in equipment for precision sheet metal fabrication to ensure we can produce parts with a high level of quality and precision. Whether you need precision components punched, machined, formed, tooled or welded, you can rest assured that our company has the right tool for the job. Some of the high-performance precision sheet metal forming equipment we have in our shop includes: Trumpf TC L3030S Laser W/Lift Master Finn-Power Flexible Manufacturing System – Automatic Loader, Turret, Right Angle Shear, Automatic Sorter and Stacker Murata Wiedematic/Laser CNC Turret Punch Press – Centrum 3000 Nova, 40 Station, 1200 Watt Capacity LVD Hydraulic Shear – Capacity 1/4 THR mild steel 120" long VM-25 CNC Mill – 25”x50" Table Travel, 24" Z Travel Hobart/Yaskawa Automatic Robotic Welding System – Servo Positioner, Computer Controlled 175 Ton 8' Cincinnati Autoform Press Brake with Automatic Back Gauge And much more ELO also has a wide range of equipment for providing finishing services such as grinding and deburring equipment, powder coating equipment, demagnetizers, electric etching tools, screen printing equipment and more. Additionally, as an affiliate of Demmer Corporation, one of the nation’s leaders in vertically integrated contract manufacturing for the aerospace and defense industries, we have access to a wide variety of additional equipment which is among the best in the industry. Our staff is cross-trained on our equipment to increase our efficiency and uses industry-best principles such as kanban, dock-to-stock, 5S and lean to reduce waste and production times. We even have a highly skilled team of engineers who can provide support services to improve the design of your precision sheet metal components, which increase part performance, reduce the cost of production or both. 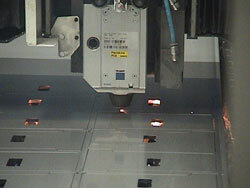 To find out more about our precision sheet metal fabrication capabilities, contact ELO Engineering, Inc. today.